1309 Roman. Asses and Dupondi which includes, Agrippa, Antonia, Nero and Drusus, Nero, Titus and Hadrian. 6 coins. All good fine to very fine. 1313 Roman. Sesterti (16), Asses and Dupondi (10). All 1st - 2nd century AD. Fair-Fine. 645 Roman. 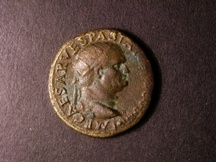 Sabina Ae dupondius, obverse diademed and draped bust with hair coiled on top, reverse Vesta seated left holding palladium and sceptre. Rome A.